Jurassic Park slot from Microgaming is a 5-reel with 243-payline game that offers amazing graphics. The dinosaur symbols are reminiscent of the Jurassic Park movie. It has a background that works like a tour of the park while the reels spin. 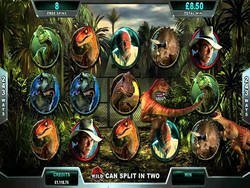 Jurassic Park slot is similar to other 243 payline Microgaming slots. Although it does not eat right away a player's account balance in chunks, the amount of wins are not interesting. Good thing there is a feature, a T-Rex Alert, that gives higher prizes. A player can get extra wilds plus extra 6 spins. Still not an impressive amount in itself, but definitely better than what the base game offers. There are rounds of free spins that have at least 5 bonus features that involve different types of dinosaurs. A player can only choose which bonus to activate after hitting the freespins round at least 25 times. Wild symbol - This is represented by the Jurassic Park logo. It is found on any of the 5 reels and can be used to replace all other symbols except the scatter symbol. Scatter symbols - The Fly in Amber serves as the scatter symbol. Like the wild symbol, it appears on any of the 5 reels. When 3 or more scatter symbols appear, any of the 5 freespin rounds is triggered. T-Rex alert - This mode is triggered randomly and is introduced by a T-Rex roar. It awards six paid spins with 35 extra wild symbols. Coin sizes - They come in 0.01, 0.02 as well as 0.05. Freespins round - It is activated after hitting freespins at least 25 times. Afterwhich, a player can select the bonus round he wants to play. These bonus rounds are T-Rex, Velociraptor, Triceratops, Brachiosaurus and Dilophosaurus. Each round is described below. Tyrannosaurus Rex bonus - It comprises 12 freespins plus wild reels. A T-Rex can turn all 5 reels wild. Velociraptor bonus - It is made up of 12 freespins plus split wilds and multiplier. Wild symbols have 4 times up to 6 times multiplier. Triceratops bonus - It includes 12 free spins plus running wilds. After each spin, the stack of wild symbols gets 1 additional symbol. Brachiosaurus bonus - It has 12 free spins plus mystery multiplier. Winnings may be multiplied from 2 times to 6 times. Dilophosaurus bonus - It includes 12 free spins plus winning wilds. Random symbols can be turned wild by the Dilophosaurus.